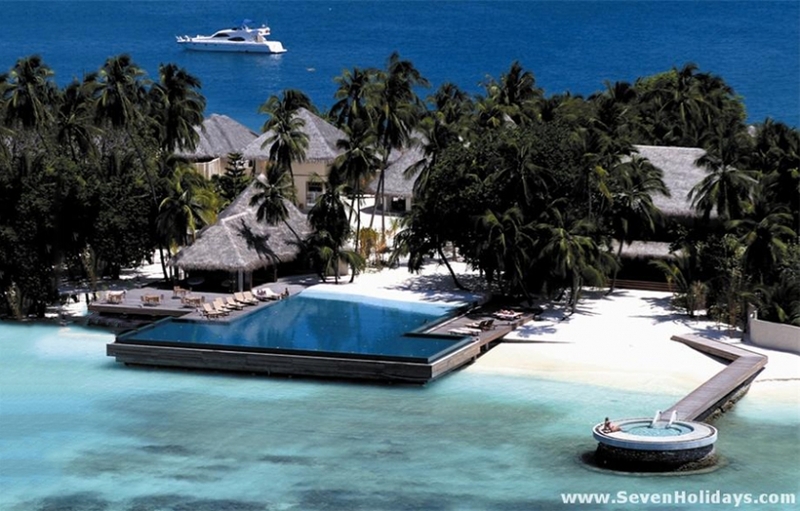 Huvafen Fushi has perfected the concept of taking a dream and making it real. The dream is the one where you live on a luxury boat being served by a personal butler as you drift between idyllic equatorial islands. Huvafen Fushi delivers the dream that has you and your partner living like the jet set, surrounded by the finest luxuries modern life has to offer, indulging in haute cuisine and ‘haute spa’. It is life taken from the pages of Condé Nast Traveller, Harper’s Bazaar and World of Interiors. 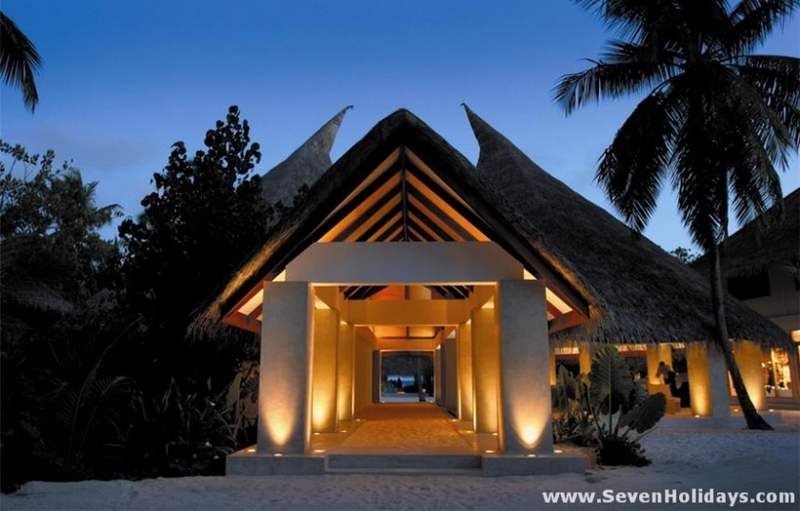 There are 3 categories of waterbungalows and land rooms. They share the same luxury elements - the plunge pool, the plasma tv and Bose surround sound, the Frette linen and L’Occitane amenities - and the same commitment to high design. What differentiates them is a greater level of design, plus size and location. Plunge pools become large plunge pools then pools, 32” plasma televisions grow to 60” and floorspace expands from 125m2 to 160m2 to 800m2 for the land rooms and 130m2 to 160m2 to 330m2 for the waterbungalows. All 8 Beach Bungalows and 2 of the 8 Deluxe Beach Bungalows face more or less north, while the other 6 deluxe beach bungalows face south to all-day sunshine. The beach bungalow side has the wider and longer beach (you can walk along uninterrupted) and slopes gently into the empty, sandy lagoon whereas the deluxe bungalow side is close to the reef for snorkeling. The beaches outside the deluxe rooms themselves, it should be said, are very good. 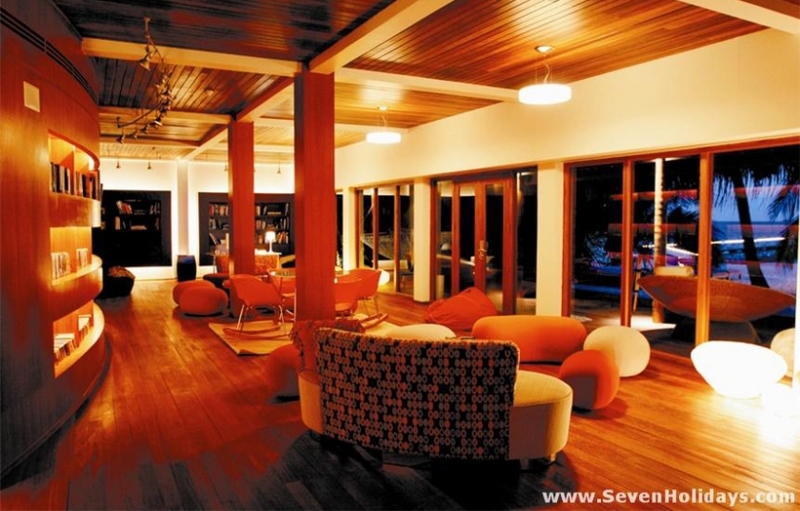 The top rooms in each category secure their privacy at the extreme ends of the resort. The single Beach Pavilion commands a swathe of south-facing beach (with a low retaining wall) and is built for pure indulgence. The master bedroom on the upper storey looks out through floor-to-ceiling glass windows and down through a glass floor to the inside-outside infinity pool. The 2 Ocean Pavilions are 100 metres further along the waterbungalow jetty and face directly to the sunset from the deck surrounding the infinity pool that flows from inside the room. 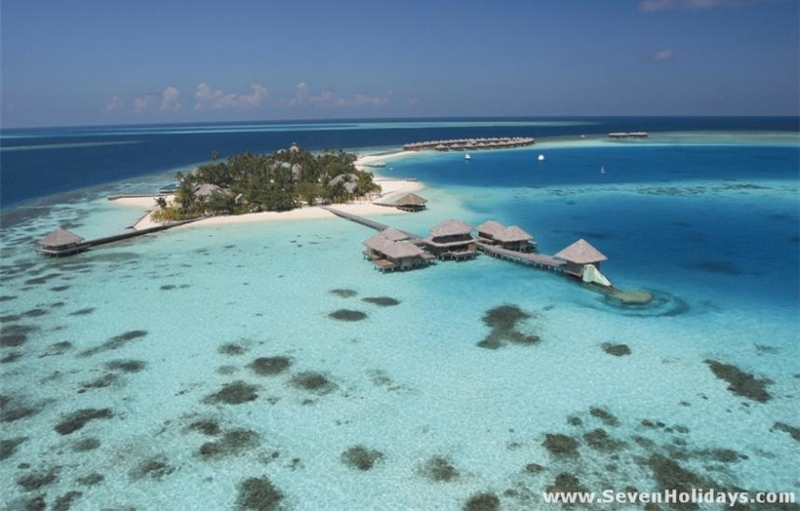 The difference between the other waterbungalows, beyond the expanded sizes and design details, is in their names. The 12 Lagoon Bungalows look from north to east into the lagoon, the 12 Ocean Bungalows look from south to west for sunshine or sunset on the deck as well as easy access to snorkeling the reef. With just 43 rooms there are 3 very different restaurants and 5 private dining venues, not including the rooms. There is the shallow end of the underlit infinity pool, the sandbank, wine cellar, yoga pavilion, underwater spa and a candlelit groyne above the water. 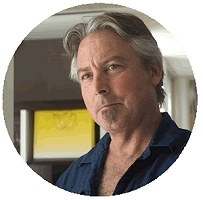 Most people come on a bed and breakfast basis and then choose between Celsius, the main restaurant, for buffets and à la carte, Salt, the fine seafood dining restaurant for Mediterranean fused with Southeast Asian, and Raw, the healthy dining restaurant for beautiful minimalist food and juices inspired by and coordinated with the spa. The island sommelier also hosts a 5-course meal matched with a few of the 700 labels in Vinium, the impressive wine cellar. The intention is to develop the cuisine and spa reputation to the point where guests come for that combination alone. Huvafen Fushi is still relatively young but I would only put Cocoa and Taj Exotica ahead of it at the top of the shortlist at the moment. What nobody else has is an underwater spa. The anticipation as you descend is fulfilled by the thrill of seeing emerge from the blue light iridescent pink and green parrotfish, batfish and hundreds of wrasses and anemone fish, all magnified by the thick glass. Then you lie face down on a table - where a mirror placed below you allows you to continue the experience. The treatments and the therapists are mostly from Bali and Thailand, concentrating on well-being, beauty and rejuvenation. For deeper states an Indian Yogi is there to take morning and late afternoon sessions in the separate pavilion over the water. And a mention should be made of the relaxation room on top of the spa, which is wide open to the sunset and sunrise sides and has a particularly good feel. 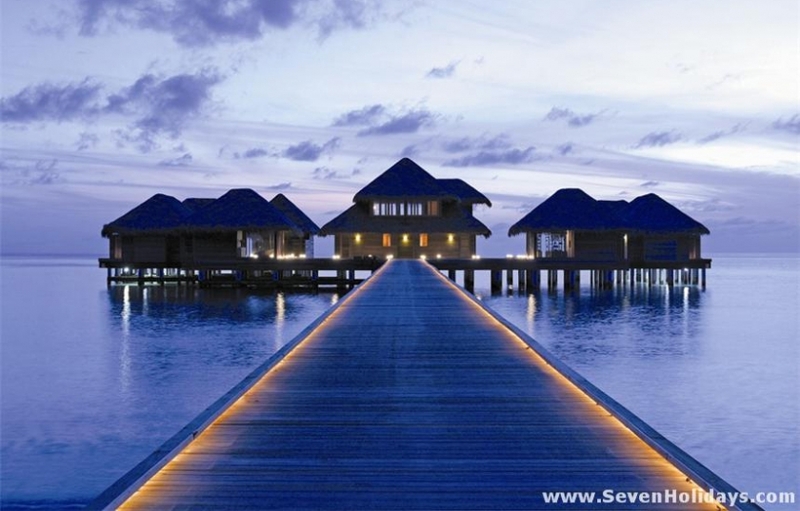 Huvafen Fushi is a beautiful place to look at and wonderfully indulgent to live in. 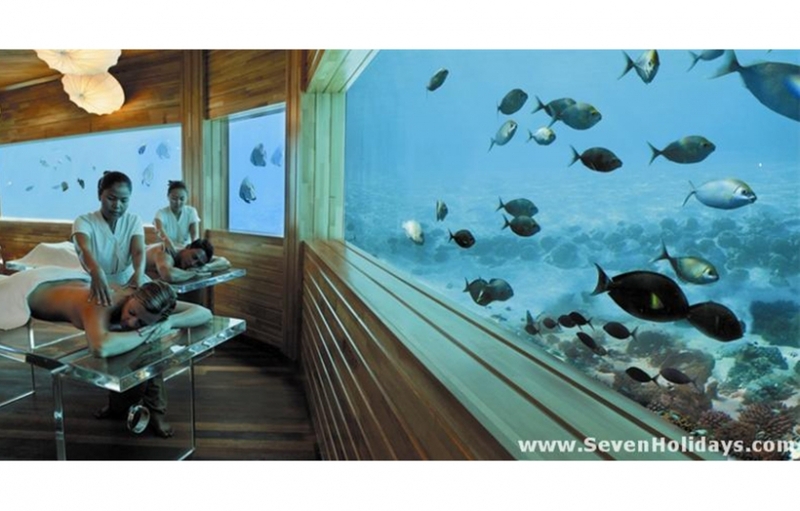 It is perfectly situated within its own lagoon, not far from the airport and with good snorkeling and a fine beach. The one thing that just seems to be missing at the moment is the collective heartbeat. That united love of a place that all the staff draw from and contribute to. But that could well come with time.